Loveable pet or delicious dish? The alpaca originated from Peru. They were thought to be domesticated by the Indians of the Andes Mountains. (6) They live in the high mountain foot hills. Who lives around the alpacas? There is not a lot of diversity where the alpacas live because of the fact that there is not a lot of oxygen in the high elevations. They live near flamingos, condors, spectaced bears, mountain lions, coyotes, llamas, and sheep. 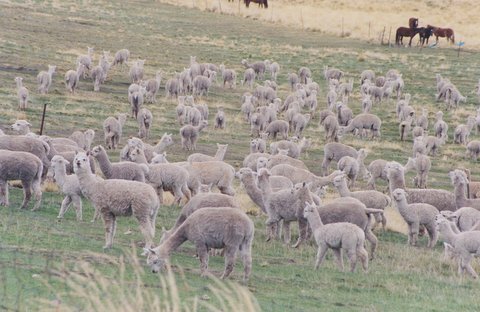 In Peru, alpacas are sometimes kept with herds of sheep. They help protect the sheep when they are out grazing in the Andes. The alpaca is tall and can see predators coming towards the herd. The alpaca will protect the sheep by chasing the predators away; they are like policemen (5) This is why the alpaca is named Vicugna pacos because pacos means policeman. Click here for full classification!